As your children get older, a challenge you encounter is what to do with a baby, toddler, or even preschooler at a sibling’s event. 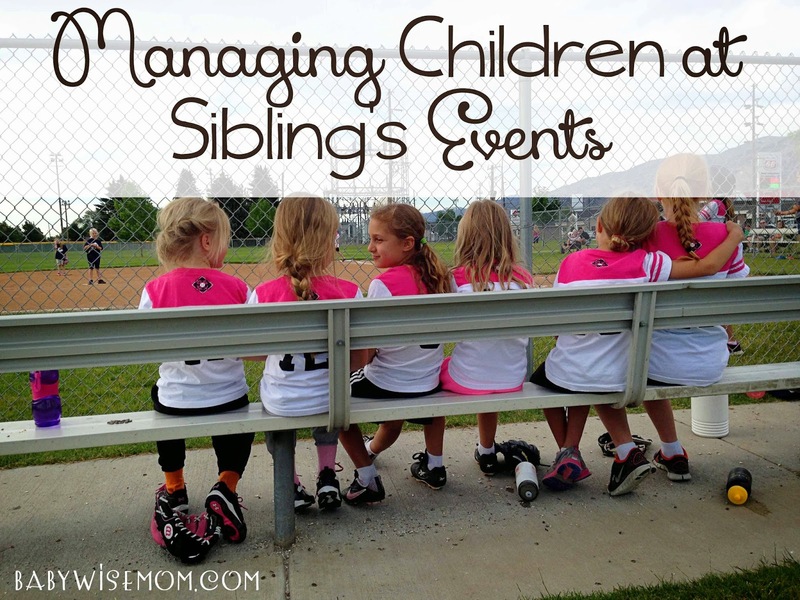 Events can be everything from a soccer game to a piano recital to a school report. Sometimes you will even have challenges with the oldest child once he needs to sit at someone’s event (he hasn’t, after all, had to do so as a young child). For me, my husband is always coaching games, so it is just the children and me. My little ones are always upset that they can’t be with dad during coaching, so I have to have ways to keep them entertained and contained. Here are some tips for you. Before you decide on rules and expectations for your children at events. You will have to have different priorities based on the event. A younger sibling might be able to play with a soccer ball next to the field during a soccer game, but will need to hold still during a piano recital. I love when an event overlaps with a mealtime when I have a toddler or preschooler. I pack lunch or dinner and have the child eat in the stroller during the game. If it is close to normal meal time, I make sure the meal is eaten at the event. It really makes it much easier for you to contain the child and be able to pay attention yourself. Even if it is not a meal time, having a snack and drink on hand is always a wise idea. If a stroller can go where you are going, bring it. Even if you don’t necessarily require your child to sit in it at all times, it is a fabulous consequence location if the child doesn’t listen. If Brinley runs onto the field during a game, she gets buckled into her stroller for the remainder of it. It doesn’t take them long to learn to either have some freedom and follow the rules or lose freedom when they break rules. There will be times, however, you will decide technology is needed. I have done it at times. When we are at swimming lessons and it is about Brinley’s bedtime and we have been sitting there for about 50 minutes, she sometimes needs to play a game on my phone for those last 10 minutes. Remember to keep your setting in mind. Technology in some events is inappropriate. Also, don’t make it an “always” thing. Save it for your last resort. I really want my children to be there for each other. I want them to cheer each other on, be happy for each other in their successes, and comfort each other in their low moments. My desire at events is for my children to get to the point where they have an interest in the event and pay attention to it. I want us to be there for each other. This past summer, Brayden (9) really started to take a lot more interest in the events of his sisters. Like I alluded to above, it can be hard for your oldest child to be expected to sit and pay attention to an event with the younger siblings start to actually get involved in things. But this last summer and on, he has shown great interest in what his sisters are doing. He watches their games. He cheers them on. He pays attention to it all. The age, maturity, and experience of your child at events will impact the exact age the child will start to be entertained by what the siblings are doing. Work toward that goal. With that in mind, try to get your child engaged in the event. I encourage Brinley to cheer along. She loves to clap and cheer for her siblings. I ask her where the ball is. For musical events, she has a high interest level in music so she is typically quite enraptured by those events anyway. For games, I point out what is happening on a basic level. Teaching your children about what is happening will help them have more interest in it. Think about yourself. Has their been a sport you have watched, not knowing the rules? Did you ever learn the rules, and if so, did your interest change when watching that sport? Appreciation for what is happening will increase interest. You can absolutely have different rules and expectations for your children based on your child’s age. Fair does not mean equal. Fair means the appropriate expectations are placed based on the child. You might allow a child to read a book at a younger age, and then when he is older, require to watch the event. You might allow a preschooler to run around and play with friends while you keep a toddler close by for safety purposes. Keep rules event, location, and age appropriate for each individual child. Remember the strategies of training in non-conflict and ask and tell. Let your child know of family expectations before you leave your home. It is also good to explain that your rules will likely differ from those of other families at the event. Remind your child that your rules are your rules no matter what everyone else is doing. If you have structured playtime at home, life will be much easier for you at games/recitals/events. A child who is accustomed to having boundaries placed will be more wiling to comply with boundaries out in public. This doesn’t mean the child will never cry, never have the tantrum, never test those boundaries. Those things will happen. But it will all be easier than it will be if you do not have structured playtime at home. What are your rules and expectations at each other’s events?